With Super Sunday on the way, here is a fun and creative recipe to share. Beat cheeses and dressing with mixer until blended. Add onions and pepper; mix well. Refrigerate several hours. 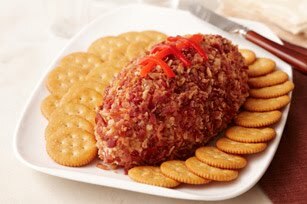 Form into football shape on serving plate; coat with bacon bits. Add pimento strips for “lacing.” Serve with crackers.